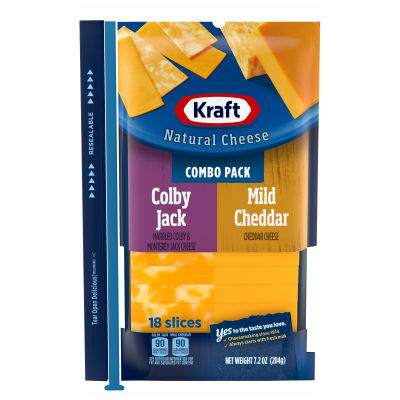 Enjoy Kraft Combo Pack Slices of Colby Jack and Mild Cheddar Natural Cheeses! These combo packs have two delicious flavors side by side for when you just can’t decide which natural cheese too choose. Always made from fresh milk, Kraft natural cheese slices are perfect for your family’s favorite sandwiches, burgers, wraps, or whatever else your family loves. Each slice in this 7.2oz package is rich and full of flavor, and since this bag is resealable, you’ll enjoy a fresh slice every time. For over 100 years, Kraft has been making the cheese your family loves. So, no matter how you like it, we’ve got a cheese for you. Serving size 2 slices (23g).